If you've ever tried wearing anything made out of satin, you'll be all too familiar with this fabric. In my opinion, it's one of the most difficult fabrics to wear. It can cling to your body in all the wrong places and along with that, there are some colours that just don't work in this fabric. Baby pink comes to mind, as does sky blue. A colour I instantly regretted wearing when I was much younger. Needless to say I never laid my hands on satin after that fiasco. But, things may be about to change. When I saw this dress on my usual dose of Zara website browsing, I instantly fell in love with the colour. Mind you, I wasn't always a fan of mustard but as the years have gone by it's grown on me. I love the rich colour and although it's in satin, the loose fit actually works. So, I set myself the challenge of styling a satin dress and I'm pleased to say I actually love it. In my opinion, one of the reasons why this dress works in satin is because it's not too tight fitting. The loose cut with the belt allows you to create a draped look around the waistline that's actually quite slimming too. A few little tricks that allow you to wear this fabric without looking like a complete fashion faux pas. Since the dress is loose fit, I opted for wide leg trousers to match and some contrasting colours to compliment the whole look and bring it all together. I think the bag certainly adds the perfect touch of glamour to this outfit. 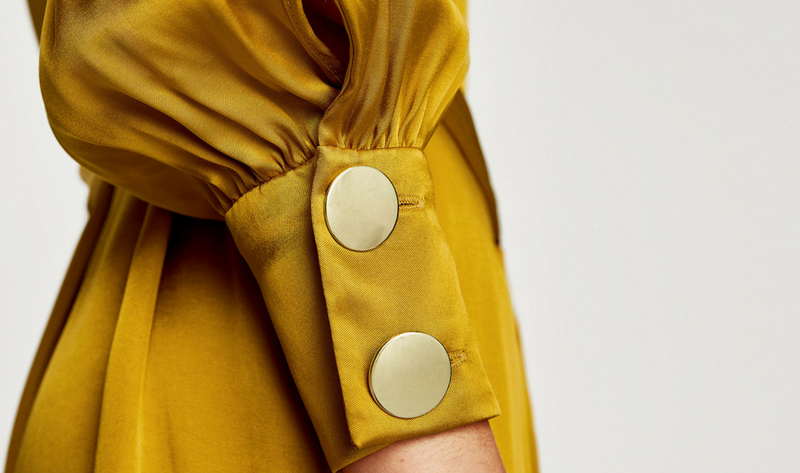 For me, the detail on the sleeves is probably what really won me over when it came to this dress. If you want to find out more, take a look at my video on my Youtube channel. I hope you enjoy my video and do let me know if you'd wear this look and how would you style this satin dress?